Jay Gould may or may not actually have said ‘I can hire half of the working class to kill the other half’, but the proprietors of the UK have tested the theory successfully with their EU referendum. Not that you would know it from reading the Guardian, the Financial Times or even, sad to say, Counterpunch and the rest of the Left-wing blogobubble, where a chorus of Influencers is celebrating the 18th Brumaire of Nigel Farage. Let me make clear what I don’t mean by that. Of course the likes of John Pilger, Michael Hudson, Tariq Ali and too many others to list are right in principle to celebrate a slap in the face of the EU manageriat and its unctuous cheerleaders. Who other than actual Eurostipendiaries would deny that the EU is an anti-democratic managerial machine built to hammer home labour discipline (sorry, ‘Competitiveness’) and ease cross-border financial looting? But the point here is not really about whether or not the satisfaction of symbolically slapping a robot outweighs the harm done by an anti-immigrant plebiscite. What cries out louder for correction right now is the myth that the ‘leave’ vote is a victory for THE working class over ‘metropolitan elites’ and incorrigibly Scottish Scots. This matters a lot, because the metropolitan, multinational working class is being told by all sides, and at the worst possible moment, that actually we don’t exist. Worse still, myths like this tend to become self-fulfilling. Which is not to say they come true, but they become truisms to the point that they start having real effects. Like that old chestnut, ‘immigrants are to blame for other workers’ immiseration’, which we’ve just witnessed in action. What actually happened is that part of the proletariat in Britain (along with a lot of proprietors large and small) voted, if not to kill the rest of us, at least against any guarantee of our continued presence here, ‘going forward’. But the very existence of ‘the rest’ is denied outright by all kinds of commentators, so that the pro-deportation voters become THE working class by default. Happily, a few statistics are enough to bring the rest of us back to life, although the numbers are a dozen clicks down on the Guardian website, behind a shitewall of Jonathan Freedland columns. You’ve probably heard that London (c. 60 percent ‘stay’ vote; = Metropolitan Elites) and Scotland (c. 60 percent; = those notorious fops of Dundee, East Glasgow and Leith) stood alone against The Country (= England, Wales and Northern Ireland Loyalists; = THE working class). That’s one way of looking at it. Specifically, a way that ignores those yuppie strongholds Manchester (60.36 percent ‘stay’), Cardiff (60.02 percent), Liverpool (58.19 percent), Bristol (61.73 percent), Leeds, Newcastle and Leicester (lower 50s); along with Edinburgh (74.44 percent), Glasgow (66.59 percent), Aberdeen (61.1 percent) and Dundee (59.78 percent) – but those last ones don’t count because they’re, well, Scotland; and Northern Ireland (55.78 percent, but apparently only Irish Republicans got out of bed that day). It’s true that the exurbs of everywhere – poor and rich alike – apparently want to get further away from the Great Multicultural Wen, and that Birmingham – the second-largest city and one of several where a large South Asian population would have been partly ineligible thanks to racist immigration laws already on the books – voted to leave by a thumping 50.42-49.58 percent, as did Sheffield (50.99 percent) and reindustrialised, ‘thriving’ Sunderland, whose genuinely thumping 61.34 percent rather complicates the immiseration = Brexitism equation. These figures already suggest that the ‘metro elites vs. THE working class’ story rests on a new definition of ‘working class’ that includes various income, education and asset ownership criteria along with: ‘DOES NOT LIVE IN A LARGE CITY (unless Birmingham)’. But a look at the breakdown within London clarifies things a bit more. Lambeth: 78.62 percent ‘stay’; Hackney: 78.48 percent; Haringey: 75.47 percent; Islington: 75.22 percent; Camden: 74.94 percent; Southwark: 72.81 percent; Lewisham: 69.86 percent; Tower Hamlets: 67.46 percent. Now, some of these places are famously half-gentrified, but the yuppies are not really as many as they look. Their wretched little burger pop-ups and locally sourced bike repair shops just stand out for some reason. All the bouroughs mentioned here show up regularly on lists of the ‘most deprived’ municipalities in Britain. (That includes Islington, ‘eighth most deprived’ but smirkingly used as a byword for privilege by columnists who tend to live in the few privileged bits.) They’re also all near the top of ‘ethnic diversity’ statistics. It should be noted at this point that the results quoted almost certainly understate local sentiment, because of the astonishing stitch-up whereby the government simply decreed that the broader layer (British, EU and legally resident Commonwealth citizens) of a two-tier electoral register wouldn’t be used. British, Irish and fully, permanently legal Commonwealth ‘nationals’ (i.e. white ex-colonial, unless old enough to have arrived pre-1971 or rich enough to get in and stay legal under current rules) would be quite enough voters, thank you very much. This latter franchise is used for parliamentary elections, while the former applies in municipal and European Parliament votes and… other referenda, at least insofar as the only relevant precedent is the Scottish secession vote, a much more narrowly ‘national’ question but one on which all electorally registered residents were allowed a say. No need to dwell on the point, but at the national turnout of 72 percent, the broader franchise would likely have delivered another 2 million+ ‘stay’ votes, comfortably reversing the overall result. If the existence of an urban working class is acknowledged, then, and if it’s additionally allowed that this creature should be sought in the cities if anywhere, and that a large part of this putative class was unable to vote but had a direct interest in voting one way, the mood of the invisible cohort seems quite clear. Sure there were a lot of urban middle-class ‘stay’ voters and a fair few suburban ones too, but without the places full of the class whose ontological status is disputed, the result for Greater London might have been, say, 53 or 51 or 49 percent ‘stay’ (and so on for Manchester, Liverpool, Glasgow…). An open invitation, then, to anyone fond of repeating the ‘Elites and Scots vs. the Poor’ story: please take a walk any time around Tottenham or Bow or Somers Town or Angell Town – or Glasgow Govan – and meet the Actually Existing Metropolitan Elites. But as already mentioned, nobody loves the EU – at least apart from the Steptford Student canvassers who educated the streets last week: The EU fights mobile phone monopolies! So why did the spectral class vote this way in those numbers? A secondary reason first: some will have noticed that what the Brexit leaders want to do with ‘freedom’ from the EU is make Britain more like the EU at its worst, i.e. inside the eurozone. Legally binding fiscal discipline! Competitive Competitiveness at last! They tend not to mention it when talking to the help, but these people openly love the Single Market and are embittered above all at its ‘betrayal’ through things like (unenforced) working hours restrictions and (Play-doh) human rights law. The other half of their dream, of course, involves properly loading the wage-bargain dice so that Goods and Services and Capital can swan about as they please while labour can be sent to its room. (If it had a room.) How dare proles who can’t find a job in the Welsh Valleys and can’t rent a stretcher-bed in London consider flitting off to work under a continental table instead of knuckling down to zero hours in Sunderland? In other words, the high-end flagfuckers look forward to intensifying the punishment of the pro- and anti-Brexit parts of the proletariat alike. This is why it’s fair to say that working-class voters for Little England were elaborately conned, but – contrary to Guardian-circulated slander – are not stupid. As Iceberg Slim taught, the ‘mark’ in a really long white con may end up fooled, but s/he should not be treated as a fool. And who wouldn’t take an apparently cost-free chance to humiliate Cameron and Osborne? The costs will come later but they would have come anyway. Or some metro-proletarian voters may have reasoned that an Anglo-parochial elite that detests them would be even more vicious raised to ‘sovereign’ status than while partly gridlocked by a Euro-liberal elite that merely despises them. This is not just a question of ‘European’ neighbours. An Anglo-English administration claiming a Nativist mandate will go after everyone, and in practice that will mean non-EU black and Asian migrants in particular, probably followed by Eastern Europeans, because special concessions will be needed for Nigel Farage’s wife and the other spouses, friends and interns of the manageriat. To hell with relative privilege, though: let my pseudonymity assure you that it’s terrifying to live here on any such revocable sufferance. None of the many, many people who say it’s too easy to come into the UK as a foreigner has ever tried to do so. 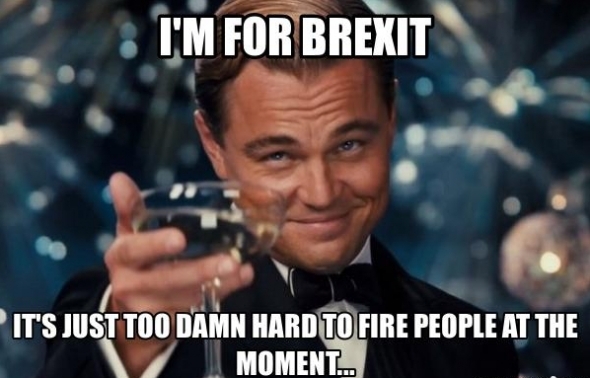 In the meantime, a lot of other workers have turned rational rage against Things As They Are into an ugly vote for Flag and Country and against the rest of their own class. But sooner or later, more or less painfully, they’ll feel the need to dump their current patrons, who also happen to be their bosses and landlords. Whenever that happens, all those Big Data-crunching bets will be off. Written in the immediate aftermath of the referendum, Notes from Non-Existence was first published by Mute on June 28, 2016. The subtitle was added by datacide.